It’s hard baking a Nutella Torte without any Nutella, I’ll give you that. But with a craving for Nutella, and only jars that were licked clean in the cupboard, there’s no other choice but to bake a Nutella-ish cake. It tastes just like the real thing, and I dare I say even better? No. Nothing can taste better than Nutella (that’s baking rule #47 if you forgot by the way). It comes pretty close though. The cake melts in your mouth and tantalizes your taste buds. 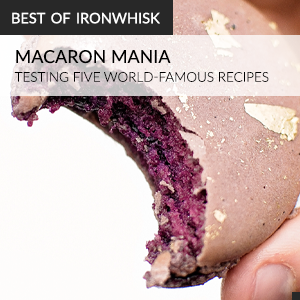 It’s chocolate goodness is complemented by the hazelnut mousse and praline ganache. And, to offset the sweetness of the cake, a strawberry-lemon coulis is perfect. It’s pure bliss. Pure chocolate bliss. If you can’t handle large amounts of chocolate (as this cake is quite chocolatey) I would suggest adding some type of sour coulis, like I did. The cake also has a nice praline chocolate crunch decoration that goes well with the soft, moist layers. It tastes just like Nestle’s Crunch chocolate bar, except it comes in a much more artistic shape (any shape you want to make really). I found broken shards looked best, but you could always set the praline chocolate crunch mixture in forms to create other shapes. This cake was delicious, and it was just what I needed to tide me over before going to the store to get more Nutella. 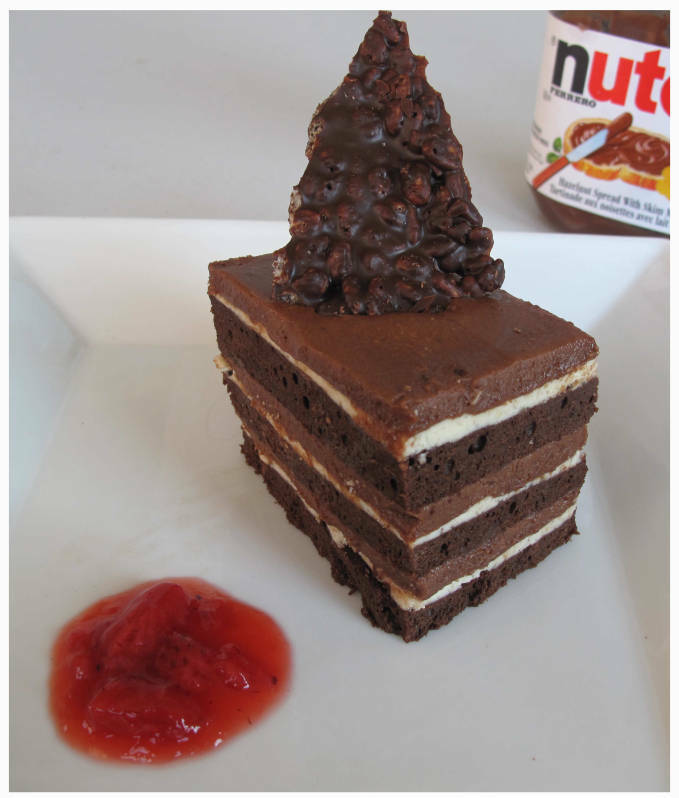 A chocolate hazelnut cake that tastes just like Nutella! Perfectly moist with a crunchy twist. Line 2 rimmed baking sheets with parchment paper. Stir sugar and ⅓ cup water in a small saucepan over medium-low heat until sugar dissolves. Increase heat and cook without stirring, occasionally swirling pan and brushing down sides with a wet pastry brush, until amber in color, 7–8 minutes. Stir in hazelnuts, then pour onto 1 prepared sheet, separating nuts. Let cool. Transfer candied nuts to a food processor. Add hazelnut oil and purée until smooth to make praline paste. Combine both chocolates and 3 Tbsp. praline paste in a medium metal bowl (reserve remaining praline paste for praline mousse layer). Set bowl over a saucepan of simmering water and stir until chocolate is melted and mixture is smooth. Remove from heat and stir in salt, then cereal. Spread out in a thin layer (about ⅛") on second pre-pared baking sheet. Chill until set, about 30 minutes. Preheat oven to 375°. Line a 17x11x1" sheet pan with parchment paper; butter paper. Sift flour and cocoa powder into a medium bowl and set aside. Separate 4 eggs, placing yolks in a large bowl and whites in a medium bowl. Using an electric mixer, beat yolks with ½ cup sugar on medium speed until thick and light yellow, about 3 minutes. Beat in 4 whole eggs, one at a time, blending well between additions. Using clean, dry beaters, beat egg whites with remaining ½ cup sugar and corn syrup until slightly thickened and frothy, about 2 minutes. Add egg-white mixture to egg-yolk mixture and beat to blend. Add flour-cocoa powder mixture; fold just to blend. Spread out evenly on prepared baking sheet. Bake until a tester inserted into center of cake comes out clean, about 15 minutes. Let cool completely. Invert cake onto a large cutting board or baking sheet and peel off parchment. Brush cake all over with brandy. Bring cream to a boil in a small saucepan. Pur ée hot cream, hazelnut butter, and salt in a food processor. Let cool to room temperature. With machine running, add butter, 1 Tbsp. at a time, puréeing until smooth between additions. Combine chocolate, praline paste, and butter in a medium bowl. Bring ¾ cup cream to a boil in a small saucepan; pour over chocolate mixture. Let stand for 1 minute, then stir until melted and smooth. Beat remaining 1 cup chilled cream until soft peaks form. Fold whipped cream into chocolate mixture. Spread nut ganache over cake and chill in freezer until set, about 15 minutes. Spread mousse over ganache and chill in freezer until set, about 15 minutes. 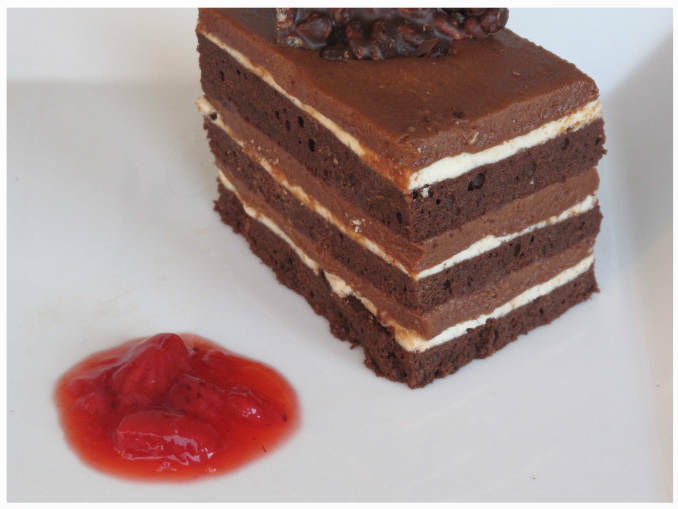 Cut cake crosswise into thirds; stack layers on top of each other. Trim edges, then spread Chocolate Glaze over top and sides of cake. Freeze until set, about 1 hour. Place in refrigerator and chill overnight. Let cake stand at room temperature for 30 minutes before serving. Break up praline chocolate crunch into large shards and arrange on top of cake.